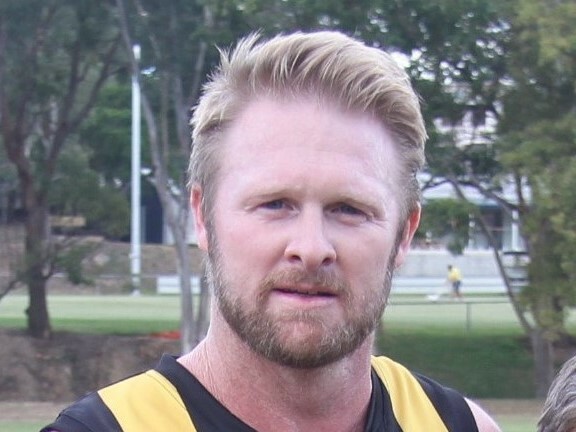 In a career that has spanned 24 years at senior level of football in Brisbane, Andrew Housego (or Housie as he is affectionately known) has achieved all there is to have achieved on a personal level at the Mayne Tigers AFC. This includes a record 4 club champion awards (an honour he shares with club legend Carl Herbert), the Mick Nolan players’ player award, record goal kicking honours, league best and fairest awards and of course multiple editions of “the biggest hit of the year” Nevertheless, it is the occasion this weekend when he breaks the games played record set in the 1930s by the indefatigable Albert Hadwen (281 games) that Housie will look back fondly on. The journey to the almost unfathomable mark of 282 senior games at the one club has been one littered with the highest of highs and all too frequent lows, more than perhaps any footballer could imagine. Housie credits his mum, life member Margaret, in making it all possible. As he reflects on a career that began in the old QAFL, against traditional foes in Morningside, Sandgate and Grange, playing alongside hundreds of players and under more coaches than the Greyhound bus company, Andrew manages to pinpoint the turning point in the clubs fortunes, which inevitably extended his playing career long enough to challenge the record mark. In the Daly era the Mayne Tigers broke a premiership drought in 2014 (and then 2015 and 2016), which extended back to Mick Nolan’s famous 1982 victory. Typically, Housie’s thoughts of the good times is of his team mates who missed out, those players whose time at Mayne was typified by a lack of success, heartbreak and pain. Included in this group is younger brother Glen – who played alongside Housie in the early 2000s. It brought a smile to Housie’s face to think that Caleb Brown and Luke Ferguson, two players that he shared the field with the most times, did receive premierships medals. Could it be that the great man will rediscover the touch that saw him boot 10 big ones on a few occasions? He rates the bag of ten against Burleigh at home in a losing side as the best he has played. On that occasion he unloaded a few long bombs from outside fifty and hints that he has been working on a new goal kicking routine (version 38 apparently!) that will entertain the crowd on hand this weekend. One thing is for certain on Saturday – whilst there will be Garth Brooks on the radio heading to the game from his new abode in Eatons Hill, the family won’t be squeezed into the trusty Ford Festiva but rather the family Toyota Prado mobile. The clicks in the ankles, knees and shoulders will be drowned out by the big crowd on hand or likely Housie himself as he wills his team mates to the contest, fires a friendly request at the umpire for a free kick or hopefully a classic bone rattling tackle from him on his hapless opponent.